We’ve been working on our new location inside Nashville Shores, and we’re ready to host some parties at our new Lakeside Getaway! Come out to Cap’n Dave’s Water Sports and hang out with the Nashville FlyBoard crew! We’ll be offering some FlyBoard® specials, and an awesome place on the lake for you and your friends to hang out while you watch. You’ll forget your so close to so many people at our new location! This is the place to go for a perfect day on the lake! One side, you can rent Jet Skis, SUPs, Kayaks, & Canoes – the other side? Learn how to Fly! 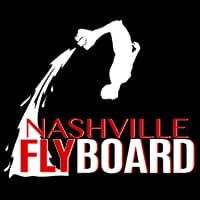 FlyBoard® & Hoverboard with the Nashville FlyBoard Crew. We’ve got party rafts if you want to hang out on the lake, and shade if you don’t! You won’t want to miss the FlyBoarding rates we’ll be offering at our new resort style location! When you come to us, you can try the FlyBoard for low rates as low as $75-85 per person for a 20-30 minute session! We’ll be running two Pro Series FlyBoards, & the Hoverboard by ZR®. If you’ve been wanting to try the FlyBoard, now’s your chance! Although we will accept walk ups, it’s best to schedule ahead. Some of These prices will continue after July 4th Weekend. If we’re set up at Cap’n Dave’s, you only pay $85 per person. As always, our crew is equipped to travel to you for your group or party event at Center Hill, Old Hickory, Tims Ford, Dale Hollow, and other places on Percy Priest by request. Hope to see you at Cap’n Dave’s Water Sports, Inside Nashville Shores! Book Online Below for July 2nd & July 3rd!